On a warm, sunny Tuesday afternoon, Sportsman’s Park was packed with a “wildly-delirious” standing-room-only crowd of 36,143, wrote Selwyn Pepper in the St. Louis Post-Dispatch about the atmosphere for just the seventh deciding game in the history of the fall classic.3 That mood quickly changed when Cardinals starting pitcher Murry Dickson yielded a leadoff single to Wally Moses. Pesky followed with what appeared to be a routine grounder, but the ball took a “weird hop,” according to Stockton, and bounced over shortstop Marty Marion’s glove.4 Dom DiMaggio’s fly to deep right-center drove in Moses for the first run. In a play that foreshadowed the Cardinals’ fielding highlights the entire game, center fielder Terry Moore made a running stab to rob Ted Williams of a possible extra-base hit. Missed scoring opportunities proved costly for the Red Sox. Bobby Doerr led off the second with a single, moved to second on third baseman Whitey Kurowski’s throwing error, and reached third with one out, but failed to score. Boston starter Dave Ferriss, who had won 25 games in the regular season and tossed a shutout in Game Three against Dickson, looked shaky from the get-go despite five days’ rest. Red Schoendienst tried to stretch his leadoff single when Williams fumbled the ball in left field, but Williams recovered quickly and threw him out. Two batters later, Stan Musial doubled down the left-field line, but was stranded. The Redbirds tied the contest in the second when Kurowski led off with a double and later scored on Harry Walker’s fly ball. It was déjà vu in the fifth when Pinky Higgins led off with a shot to deep center. Moore raced at least 50 yards to make what Keener called the “greatest catch of his notorious career,” a running backhanded stab near the wall.8 Moore, once regarded as the premier center fielder in the NL, discovered the fountain of youth despite having missed the three previous years to World War II. The 34-year-old suffered from swelling in his left knee and requiring what sportswriter W. Vernon Tietjen called “special ‘dope’ ointment” from team trainer H.J. “Doc” Weaver before each game.9 After Moore’s gem, Kurowski atoned for his earlier miscue by racing deep into foul territory to snag Hal Wagner’s popup. The Redbirds pounded Ferriss savagely in the fifth. Walker led off with a single and moved to second on Marion’s sacrifice bunt. 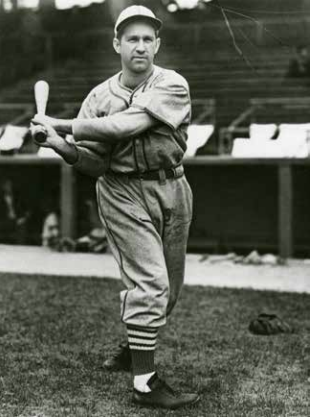 Dickson, no slouch at the plate, lined a double to score Walker and give the Cardinals a 2-1 lead.10 After Schoendienst’s single drove in Dickson, Moore’s single sent Ferriss to the showers while “bedlam reigned” in Sportsman’s Park.11 Right-hander Joe Dobson put out the fire by retiring Musial on a grounder and, after an intentional walk to Slaughter to fill the bags, getting Kurowski to ground into a force play to end the threat. Tension mounted as neither the Red Sox nor Cardinals managed a hit in the sixth or seventh inning. Down 3-1 to start the eighth, Boston’s Rip Russell, pinch-hitting for Wagner (who was hitless in 13 Series at-bats), lined a single. Cardinals first-year skipper Eddie Dyer motioned to Harry Brecheen and Red Munger to hastily warm up in the bullpen, while Red Sox manager Joe Cronin sent George Metkovich to pinch-hit for Dobson. Metkovich’s double pushed Russell to third and spelled Dickson’s demise. To the mound came Brecheen, the slightly built, 5-foot-10, 160-pound southpaw whose quick movements earned him the nickname “The Cat.” A 15-game winner with a league-best five shutouts during the regular season, Brecheen had tossed a complete-game seven-hitter two days earlier to force Game Seven and had blanked the Red Sox on four hits in Game Two. Brecheen retired Moses and Pesky, but then surrendered his first hard-hit ball of the Series, DiMaggio’s double off the wall in right field, out of reach of the leaping Slaughter, to drive two runs and tie the game. DiMaggio’s dramatic hit proved costly, however, as he pulled a muscle in his leg and was replaced by Leon Culberson. After Williams’s foul tip split the finger of catcher Joe Garagiola, necessitating his replacement by Del Rice, the Red Sox slugger popped up harmlessly to Schoendienst to end the inning. The eighth inning is one of the most torturous and second-guessed frames in Red Sox history. Right-handed reliever Bob Klinger took the mound and yielded a leadoff single to Slaughter, then retired Kurowski and Rice. Next was Walker, described by Bob Broeg as a “regular season flop” after batting just .237,12 Slaughter darted from first in a hit-and run as Klinger made his delivery home. Walker belted a line drive to center field, where Culberson was playing deep. Slaughter had almost reached third as Culberson made a relay throw to Pesky in shallow center. J. Roy Stockton was sure Slaughter would meet “certain death” as third-base coach Miguel “Mike” Gonzalez waved him home.13 Pesky, momentarily caught off guard by Slaughter’s aggression, dropped his arms and “pivoted slowly” before firing home, according to Jerry Nason of the Boston Globe.14 Slaughter slid across home plate well ahead of Pesky’s weak throw as Walker advanced to second.15 “I hesitated,” admitted Pesky after the game. “I thought he’d hold up at third so late in the game.”16 After Klinger intentionally walked Marion, new reliever Earl Johnson retired Brecheen to end the threat. The ninth inning proved to be equally gut-wrenching. Rudy York and Doerr led off with singles; Higgins’s grounder forced Doerr at second. Needing just a long fly to tie the game, Roy Partee popped one of Brecheen’s slow screwballs to first for the second out. Tom McBride, pinch-hitting for Johnson, hit what Keener called, a “tough bounder, a hippety-do-hopper” to Schoendienst.17 “It was a screwy, curving ball,” said Schoendienst. “It hit me ... on the right wrist ... and rolled up my forearm. Then I clamped my arm over it ... under the shoulder in time to grab the ball.”18 His shovel toss to Marion at second forced Higgins, ending the game in 2 hours and 17 minutes and giving the Cardinals their sixth championship since 1926. In addition to the sources cited in the Notes, the author also accessed Retrosheet.org, Baseball-Reference.com, SABR.org, and The Sporting News archive via Paper of Record. 1 Whitney Martin (Associated Press), “Slaughter Run Like Paul Revere’s Ride,” Boston Globe, October 16, 1946: 19. 2 J. Roy Stockton, “Slaughter’s Run to Certain Death Is Winning Gamble; Brecheen and Walker Also Heroes of Epic Finish,” St. Louis Post-Dispatch, October 16, 1946: 2B. 3 Selwyn Pepper, “Fans Wildly Delirious as Home Team Takes Final Series Contest,” St. Louis Post-Dispatch, October 15, 1946:1B. 4 J. Roy Stockton, “Walker Drives In Slaughter in 8th to Beat Red Six, 4-3,” St. Louis Post-Dispatch, October 15, 1946: 1B. 6 Sid Keener, “Brecheen Is Team’s Hero in Dramatic 4-3 Victory; Decisive Run by Slaughter,” St. Louis Star and Times, October 16, 1945: 20. 7 Hy Hurwitz, “Ted Just Sits and Stares for Half-Hour After Game,” Boston Globe, October 16, 1946: 1. 8 Sid Keener, “Moore and Walker Race to Distant Sectors to Haul Down Drives by Red Sox,” St. Louis Star and Times, October 15, 1946: 2. 9 W. Vernon Tietjen, “Step Right Up, Folks, and Pick Your Series Hero — Cardinals Have Them by the Dozens,” St. Louis Star and Times, October 16, 1946: 20. 10 Dickson batted .277 (18-for-65) with six extra-base hits in the regular season. 12 Walker had been an All-Star in 1943, batting .294 in his last full season before missing the next two seasons during the war. Bob Broeg, “Eight Records Set, 10 Tied in Series,” St. Louis Post-Dispatch, October 16, 1946: 4N. 14 Jerry Nason, “Slaughter, Brecheen Give Cards Series Finale,” Boston Globe, October 16, 1946: 1. 15 A video of this exciting play can be seen on You Tube. youtube.com/watch?v=t7IgTE593oA. 16 Harold Kaese, “Why Did Sox Lose? Series Inexperience, Soft Pennant Race, Williams’ Slump,” Boston Globe, October 16, 1946: 20. 20 George C. Carens, “DiMaggio Injury Big Game Break,” Boston Traveler, October 16, 1946: 32. 21 Grantland Rice, “Not Best I’ve Seen, but Gamest, Says Dyer of Cards,” Boston Globe, October 16, 1946: 22. 22 The other pitchers to win three games in a single World Series were Deacon Phillippe (Pittsburgh Pirates) and Bill Dineen (Boston Americans) in 1903; Christy Mathewson with the New York Giants in 1905; the Pirates’ Babe Adams in 1909; Jack Coombs (Philadelphia Athletics) in 1910; Smoky Joe Wood of the Red Sox in 1912; Red Faber (Chicago White Sox) in 1917; and finally Stan Coveleski (Cleveland Indians) in 1920. 23 Broeg’s pronouncement was hardly the stuff of homerism; the Cardinals bettered the Red Sox in almost every meaningful offensive and defensive category. The final batting slash for the Cardinals was .259/.320/.371 compared with .240/.309/.330 for the Red Sox. The Cardinals team ERA was 2.32; Red Sox 2.95; and finally the Cardinals committed four errors to the Red Sox’ 10. 26 Hughson started games One and Four, though lasted just two innings in the latter. In game Six he hurled 4⅓ innings of scoreless relief.